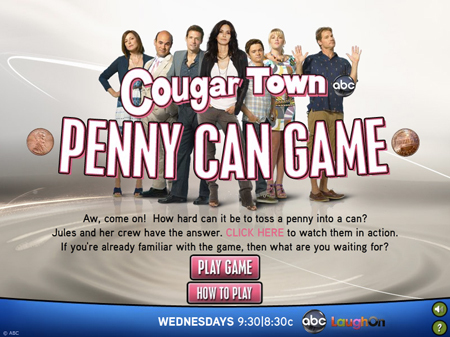 Despite its rocky start last fall, Cougar Town has quickly become one of my favorite TV comedies. From the hilarious antics of Bobby and Andy to the rivalry of Laurie and Ellie and the songs by Grayson that are forever stuck in my head, I am an avid fan and was beyond thrilled when the Season 2 premiere finally aired last week (for the best moments of the episode, click here). Yup, the game that started on Bobby's boat has finally made it to World Wide Web. Players can choose which character they want to play as in over 10 levels that increase in difficulty (by the end, you are bouncing pennies off of guitars and TVs). Watch out for cameos from the pool alligator as well as clips from the show between each level (my favorite is the Ellie/Jules 'girl chest bump' montage). Click the link above to play and don't forget to scream "Penny Caaaaannnn!!!!!" every time you win! Glee: S-A-F-E-T-Why Such Sad Material?